Area: 1,964,375 sq. km. (761,600 sq. mi. ); about three times the size of Texas. Cities: Capital: Mexico City (22 million, estimate for metro area). 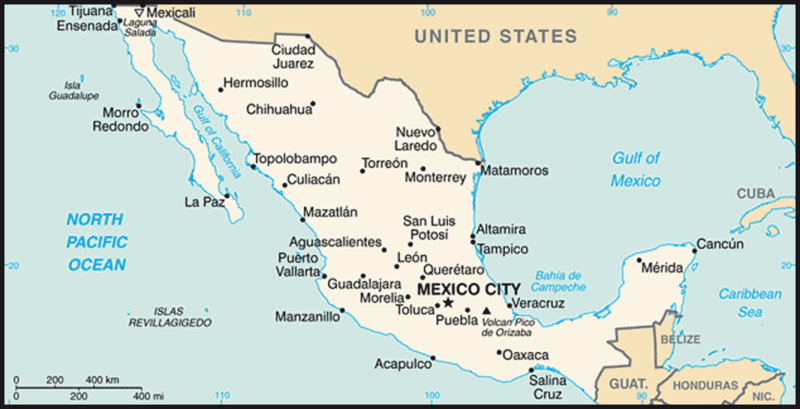 Other major cities — Guadalajara, Monterrey, Puebla, Ciudad Juarez, Tijuana, Acapulco, Merida, Leon, Veracruz. Nationality: Noun and adjective — Mexican(s). Population (July 2011 est. ): 113,724,226. Annual population growth rate (2011 est. ): 1.102%. Education: Years compulsory: 11 (note: preschool education was made mandatory in Dec. 2001). Literacy — 91.4%. Health (2011): Infant mortality rate: 17.29/1,000. Life expectancy — male 73.65 years; female 79.43 years. Work force (2010 est., 47 million): Agriculture — 13.7%, industry — 23.4%, services — 62.9%. Branches: Executive: president (chief of state and head of government). Legislative — bicameral. Judicial — Supreme Court, local and federal systems. GDP (nominal): $1.04 trillion (2010); $876 billion (2009); $1.088 trillion (2008). GDP (purchasing power parity): $1.459 trillion (2009 est. ); $1.550 trillion (2008). Per capita GDP (nominal, 2010): $9,395. Annual real GDP growth: 5.4% (2010); -6.1% (2009); 1.3% (2008). Agriculture (5% of GDP): Products: corn, wheat, soybeans, rice, beans, cotton, coffee, fruit, tomatoes, beef, poultry, dairy products, wood products. Industry (31% of GDP): Types: food and beverages, tobacco, chemicals, iron and steel, petroleum, mining, textiles, clothing, motor vehicles, consumer durables. Services (64% of GDP): Types: commerce and tourism, financial services, transportation and communications. Trade (goods): Exports (2010): $298 billion f.o.b. Imports (2010) — $301 billion f.o.b. Exports to U.S. (2010) — $230 billion (80% of total). Imports from U.S. (2010) — $163 billion (50% of total). Major markets — U.S., EU (5% of total), South America (5% of total). Mexico is the most populous Spanish-speaking country in the world and the second most-populous country in Latin America after Portuguese-speaking Brazil. About 76% of the people live in urban areas. Many Mexicans emigrate from rural areas that lack job opportunities — such as the underdeveloped southern states and the crowded central plateau — to the industrialized urban centers and the developing areas along the U.S.-Mexico border. According to some estimates, the population of the area around Mexico City is nearly 22 million, which would make it the largest concentration of population in the Western Hemisphere. Cities bordering on the United States — such as Tijuana and Ciudad Juarez — and cities in the interior — such as Guadalajara, Monterrey, and Puebla — have undergone sharp rises in population in recent years. Mexico has made great strides in improving access to education and literacy rates over the past few decades. According to a 2006 World Bank report, enrollment at the primary level is nearly universal, and more children are completing primary education. The average number of years of schooling for the population 15 years old and over was around 8 years during the 2004-2005 school year, a marked improvement on a decade earlier — when it was 6.8 years — but low compared with other Organization for Economic Cooperation and Development (OECD) countries. Independence from Spain was proclaimed by Father Miguel Hidalgo on September 16, 1810. Father Hidalgo's declaration of national independence, "Viva Mexico!," known in Mexico as the "Grito de Dolores," launched a decade-long struggle for independence from Spain. Prominent figures in Mexico's war for independence were: Father Jose Maria Morelos; Gen. Augustin de Iturbide, who defeated the Spaniards and ruled as Mexican emperor from 1822-23; and Gen. Antonio Lopez de Santa Ana, who went on to dominate Mexican politics from 1833 to 1855. An 1821 treaty recognized Mexican independence from Spain and called for a constitutional monarchy. The planned monarchy failed; a republic was proclaimed in December 1822 and established in 1824. Mexico's severe social and economic problems erupted in a revolution that lasted from 1910 until 1920 and gave rise to the 1917 constitution. Prominent leaders in this period — some of whom were rivals for power — were Francisco Madero, Venustiano Carranza, Pancho Villa, Alvaro Obregon, Victoriano Huerta, and Emiliano Zapata. The Institutional Revolutionary Party (PRI), formed in 1929 under a different name, emerged from the chaos of revolution as a vehicle for keeping political competition among a coalition of interests in peaceful channels. For 71 years, Mexico's national government was controlled by the PRI, which won every presidential race and most gubernatorial races until the July 2000 presidential election of Vicente Fox Quesada of the National Action Party (PAN), in what were widely considered at the time the freest and fairest elections in Mexico's history. President Fox completed his term on December 1, 2006, when Felipe Calderon, also of the PAN, assumed the presidency. The 1917 constitution provides for a federal republic with powers separated into independent executive, legislative, and judicial branches. Historically, the executive has been the dominant branch, with power vested in the president, who promulgates and executes the laws of the Congress. The Congress has played an increasingly important role since 1997, when opposition parties first made major gains. The president also legislates by executive decree in certain economic and financial fields, using powers delegated by the Congress. The president is elected by universal adult suffrage for a 6-year term and may not hold office a second time. There is no vice president. Mexico maintains an embassy (http://embamex.sre.gob.mx/eua/) in the United States at 1911 Pennsylvania Ave. NW, Washington, DC 20006 (tel. 202-728-1600). Consular offices are located at 2827 - 16th St. NW, 20009 (tel. 202-736-1000), and the trade office is co-located at the embassy (tel. 202-728-1687, fax. 202-296-4904). President Calderon's National Action Party currently is the largest party in the Senate but lost its majority in the Chamber of Deputies in the July 2009 elections. The PRI gained a de facto majority (through its alliance with another party) in those elections in which every Chamber of Deputies seat was up for vote. Although the PRI does not control the presidency or a majority in the Senate, it remains a significant force in Mexican politics, holding or having recently been elected to 19 of 31 governorships and often playing a pivotal role in forming coalitions in Congress. The next national elections — for the president, all 128 seats in the Senate, and all 500 seats in the Chamber of Deputies — will take place in July 2012. In addition to judicial reform, President Calderon has also succeeded in negotiating with Congress to pass security, fiscal, electoral, energy, and pension reforms. The administration is grappling with many economic challenges, including the need to upgrade infrastructure, modernize labor laws, and make the energy and manufacturing sectors more competitive. Calderon has stated that his top economic priorities remain reducing poverty and creating jobs. In the face of the serious threat posed by organized crime, the Mexican Congress passed legislation to expand the investigative and intelligence capabilities of the country's Federal Police. The Mexican Government has also bolstered vetting and training requirements for local, state, and federal police forces. In July 2011, the Mexican Supreme Court ruled that all human-rights related crimes, including those committed by the military, should be tried in civilian courts. Mexico is classified by the World Bank as an upper-middle-income country. Poverty is widespread (around 44% of the population lives below the poverty line), and high rates of economic growth are needed to create legitimate economic opportunities for new entrants to the work force. The Mexican economy grew by more than 5% in 2010 after a sharp recession in 2009 during the global economic crisis. Since the 1994 devaluation of the peso, successive Mexican governments have improved the country's macroeconomic fundamentals. Inflation and public sector deficits are under control, while the current account balance and public debt profile have improved. Mexico's sovereign debt remains investment-grade, with a stable outlook. Mexico's tax revenue as a percentage of gross domestic product (GDP) was 17.5% in 2009, the lowest of OECD members. Mexico is a major recipient of remittances, sent mostly from Mexicans in the United States. Remittances amounted to $21.3 billion in 2010 and are the country's second-largest source of foreign currency, after oil. Most remittances are used for immediate consumption — food, housing, health care, education — but some collective remittances, sent from a U.S. community of migrants to their community of origin, are used for shared projects and infrastructure improvements. The Government of Mexico participates through its flagship fund-matching program "3X1 Program for Migrants." The Mexican Government also has implemented social development programs, like Oportunidades, to address the problems of poverty. Mexico is one the most popular tourist destinations in the world. It attracted 21.3 million international tourists in 2010, making it the tenth-most popular international destination in terms of arrivals. Tourism contributed $11.8 billion to Mexico's economy in 2010, one of the top sources of foreign exchange for the country. Mexico's trade regime is built upon 13 trade agreements with 44 countries, including the United States, Canada, and the European Union. In 2010 it exported nearly $300 billion of goods, led by electronic and other machinery (38% of total), road vehicles and transportation equipment (17.8%), and mining and crude oil (14.6%). Mexico relies heavily on supplying the U.S. market but has also sought to diversify its export destinations. Eighty percent of Mexico's exports went to the United States in 2010, down from a high of nearly 90% in 2001. The United States exported $163 billion of goods to Mexico in 2010. Mexico is the United States' second-largest export market (after Canada) and third-largest trading partner (after Canada and China). Two-way trade (exports plus imports) reached nearly $400 billion in 2010, more than quadruple what it was 20 years ago. Top U.S. exports to Mexico include electronic equipment, motor vehicle parts, and chemicals. Trade matters are generally settled through direct negotiations between the two countries or addressed via World Trade Organization (WTO) or North American Free Trade Agreement (NAFTA) formal dispute settlement procedures. Mexico is an active and constructive member of the World Trade Organization, the G-20, and the Organization for Economic Cooperation and Development. Mexico is making progress in its intellectual property rights enforcement efforts, although piracy and counterfeiting rates remain high. Mexico appeared on the Watch List in the 2011 Special 301 report. The U.S. continues to work with the Mexican Government to implement its commitment to improving intellectual property protection. Mexico's agricultural sector accounts for 5% of GDP and employs 13.7% of the work force. Top revenue-producing crops include corn, tomatoes, sugar cane, dry beans, and avocados. Mexico also generates significant revenue from the production of beef, poultry, pork, and dairy products. Implementation of NAFTA has opened Mexico's agricultural sector to the forces of globalization and competition, and some farmers have greatly benefited from greater market access. In particular, fruit and vegetable exports from Mexico have increased dramatically in recent years. However, structural inefficiencies that have existed for decades continue to limit improvements in productivity and living standards for many in the agricultural sector. These inefficiencies include a prevalence of small-scale producers, a lack of infrastructure, inadequate supplies of credit, a communal land structure for many producers, and a large subsistence rural population that is not part of the formal economy. It is estimated that half of Mexico's producers are subsistence farmers and over 60% produce corn or beans, with the majority of these farmers cultivating five hectares or less, although the number of Mexican farmers is steadily decreasing as they seek greater economic opportunities from off-farm employment. Foreign direct investment (FDI) in Mexico for 2010 was $17.7 billion, up slightly from 2009 but still below the peak levels of the mid-2000s. The global economic slowdown in 2008 and 2009 caused a significant decline in FDI. Portfolio investment totaled $37.1 billion in 2010. Most portfolio investment was in local bond issuances. In 2010, Mexico was the seventh-largest oil producer in the world and the second-largest supplier of oil to the United States. State-owned Petroleos Mexicanos (Pemex) holds a constitutionally-established monopoly for the exploration, production, transportation, and marketing of the nation's oil and is one of the largest oil companies in the world. However, oil production has decreased in recent years as production at the giant Cantarell field continues to decline. The oil sector is a crucial component of Mexico's economy; while its relative importance to the general Mexican economy has declined in the long term, the oil sector still generated 14% of the country's export earnings in 2010, according to Mexico's central bank. More importantly, the government relies upon earnings from the oil industry (including taxes and direct payments from Pemex) for 32% of total government revenues. Therefore, any decline in oil production has a direct effect upon the country's overall fiscal balance. In early 2011, Mexico held licensing rounds for performance-based contracts on oil blocks, allowing participation by foreign oil companies for the first time since the nationalization of the oil industry in 1938. The foreign firms will have no ownership rights over any oil they produce, but they are expected to provide Mexican fields with needed technological improvements. The World Economic Forum ranks Mexico 79th globally on the overall quality of its infrastructure (out of 139 countries). A National Infrastructure Plan of $233 billion is designed to raise the coverage, quality, and competitiveness of the country's infrastructure assets. Mexico's land transportation network is one of the most extensive in Latin America with 356,000 kilometers of paved roads. In terms of road density, however, Mexico has one of the lowest rates among the major economies in the region. Three major private companies operate Mexico's 27,000-km railroad network. Mexico's sea ports have experienced a boom in investment and traffic following a 1993 law that privatized the port system. Mexico's ports moved 3.3 million 20-foot container equivalent units (TEU) in 2008 and 2.9 million TEUs in 2009. Manzanillo is the largest container port, followed by Veracruz and Altamira. Several dozen international airlines serve Mexico, with direct or connecting flights from most major cities in the United States, Canada, Europe, Japan, and Latin America. Most Mexican regional capitals and resorts have direct air services to Mexico City or the United States. In 2010, 24.1 million air passengers visited Mexico. The telecommunications sector is dominated by Telmex, the former state-owned monopoly, and its mobile telephone spinoff, America Movil. Several international companies compete in the sector with limited success. The fixed-line teledensity rate in Mexico (18%) is below the average for Latin America. Wireless penetration is much higher (more than 75%), with 91.3 million wireless subscribers in 2010, although many of these customers rely on prepaid cards or use their phones to receive calls only. In 2010, 35 million Mexicans had some form of Internet access. Mexico's armed forces number about 225,000. The air force is a semiautonomous organization that reports to the head of the army, and together the army and air force make up about three-fourths of that total. The navy is a completely autonomous cabinet agency, and there is no joint chief of staff position. Principal military roles include national defense, narcotics control, and civic action assignments such as search and rescue and disaster relief. Mexico's federal, state, and municipal police forces number approximately 450,000, including analysts and investigators. At the state and local level, police are generally divided into "preventive" and "judicial" police. Preventive police maintain order and public security and generally do not investigate crimes. As noted previously, the Mexican Congress passed legislation in 2009 expanding the investigative and intelligence capabilities of the Federal Police, which has expanded from 4,000 personnel at the beginning of the Calderon administration to over 35,000. President Calderon has made combating organized crime a priority of his administration and, to that end, has deployed the Mexican military to 10 Mexican states to assist (or replace) the weak and often corrupt local and state police. Transnational criminal organizations (TCOs) have responded to increased pressure on their activities with unprecedented violence directed mostly at competing cartels, but also government security forces and innocent citizens. They have also expanded their business beyond narcotics into kidnapping, migrant smuggling, and extortion. New estimates suggest that of over the roughly 40,000 deaths attributed to narco-violence since December 2006, nearly 2,000 were members of the Mexican security services. The Mexican military and police have been increasingly successful in carrying out operations to remove top cartel leaders, including Jose de Jesus "El Chango" Mendez (La Familia cartel — arrested in June 2011); Antonio Ezequiel Cardenas Guillen "Tony Tormenta" (Gulf Cartel — killed in a shootout in November 2010); Edgar Valdez Villareal "La Barbie" (Beltran Leyva Cartel — arrested in August 2010); Ignacio Coronel Villareal "Nacho" (Sinaloa Cartel — killed in shootout in July 2010); Eduardo Teodoro Garcia Semental "El Teo" (Arellano Felix Cartel — arrested in January 2010); Carlos Beltran Leyva (Beltran Leyva Cartel — arrested in January 2010); and Arturo Beltran Leyva (Beltran Leyva Cartel — killed during an attempted arrest in December 2009.) As the military has stepped up its engagement in law enforcement activities, allegations of human rights abuses against the military have also increased. Mexico's efforts to reform its judicial sector and professionalize its police forces reflect its commitment to promote the rule of law and build strong law enforcement institutions to counter the threat posed by organized crime. The U.S. assists Mexico in this effort through the multi-year $1.6 billion Merida Initiative, which directly supports programs to help Mexico train its police forces in modern investigative techniques, promote a culture of lawfulness, and implement key justice reforms. Elements of the police force began to replace the military in strategic locations in 2010. Mexico is a strong supporter of the United Nations and Organization of American States systems. While selective in its membership in other international organizations, it pursues its interests through a number of ad hoc international bodies. Mexico was the Secretary Pro Tempore of the Rio Group for the term 2008-2010; separately, it held a seat on the UN Security Council for the period 2009-2010. In late 2010, Mexico hosted the 16th Conference of the Parties of the UN Framework Convention on Climate Change. Whereas Mexico declined to become a member of Organization of Petroleum Exporting Countries, it nevertheless seeks to diversify its diplomatic and economic relations, as demonstrated by its accession to the General Agreement on Tariffs and Trade (GATT) in 1986; its joining the Asia-Pacific Economic Cooperation forum (APEC) in 1993; its becoming, in April 1994, the first Latin American member of the Organization for Economic Cooperation and Development (OECD); and its entering the World Trade Organization as a founding member in 1996. Mexico attended the first Summit of the Americas, held in Miami in 1994; managed coordination of the agenda item on education for the 1998 Summit of the Americas in Santiago, Chile; hosted a Special Summit of the Americas in early 2004; and participated actively in the 2009 Summit of the Americas in Port of Spain, Trinidad and Tobago. In 2002 it hosted the APEC Leaders' Meeting in Cabo San Lucas. Mexico hosted the September 2003 WTO Ministerial in Cancun and a Hemispheric Security Conference in October of the same year. It was elected to the International Atomic Energy Agency Board of Governors in 2003. Mexico has emerged as a key middle income player in the G-20 and hosted an H1N1 Conference in Cancun in 2009. U.S. relations with Mexico are important and complex. U.S. relations with Mexico have a direct impact on the lives and livelihoods of millions of Americans — whether the issue is trade and economic reform, homeland security, drug control, migration, or the environment. The U.S. and Mexico are partners in NAFTA, and enjoy a broad and expanding trade relationship. Since the first North American Leaders' Summit in 2005, the United States, Canada, and Mexico have been cooperating more closely on a trilateral basis to improve North American competitiveness, ensure the safety of our citizens, and promote clean energy and a healthy environment. The three nations also cooperate on hemispheric and global challenges, such as managing transborder infectious diseases and seeking greater integration to respond to challenges of transnational organized crime. The scope of U.S.-Mexican relations goes far beyond diplomatic and official contacts; it entails extensive commercial, cultural, and educational ties, as demonstrated by the annual figure of about a million legal border crossings a day. In addition, a million American citizens live in Mexico and approximately 10 million Americans visit Mexico every year. More than 18,000 companies with U.S. investment have operations there, and the U.S. accounts for nearly $100 billion of foreign direct investment in Mexico. Along the 2,000-mile shared border, state and local governments interact closely. There has been frequent contact at the highest levels. Presidents' meetings have included a visit by President Calderon to Washington, DC to meet with President-elect Barack Obama in January 2009; visits by President Obama to Mexico City in April 2009 and to Guadalajara in August 2009 for the North American Leaders' Summit; a visit by President Calderon to Pittsburgh in September 2009 for a G-20 Summit; a state visit, hosted by President Obama, in honor of President Calderon in May 2010; and President Calderon's visit to Washington in March 2011. In recent years, U.S.-Mexico cooperation in the struggle against organized crime and drug trafficking has been unprecedented. At the August 2007 North American Leaders' Summit in Montebello, Canada, Presidents George W. Bush and Calderon announced the Merida Initiative to work together and with the countries of Central America to combat drug trafficking and organized crime in the region. In June 2008, President Bush signed the congressional appropriations bill allocating assistance to Mexico as part of the Merida Initiative. Appropriated funds for Mexico under the initiative totaled $1.5 billion as of the end of 2010. In March 2010, Secretary of State Hillary Clinton and her Mexican counterpart Patricia Espinosa chaired a high-level group meeting that announced four strategic pillars for U.S.-Mexico cooperation. The first pillar aims to disrupt the capacity of organized crime to operate by capturing criminal groups and their leaders and reducing their revenues through better investigations, successful prosecutions, and shipment interdictions. The initiative's second pillar focuses on enhancing the capacity of Mexico's government and institutions to sustain the rule of law. The Merida Initiative's third pillar aims to improve border management to facilitate legitimate trade and movement of people while thwarting the flow of drugs, arms, and cash. Finally, the fourth pillar seeks to build strong and resilient communities. This high-level group met again in April 2011 to underscore the bilateral strategic partnership between the United States and Mexico, to reaffirm the four-pillar approach, and to ratify the shared commitment to achieving long-term solutions to the challenges posed by transnational organized crime. Cooperation between the United States and Mexico along the 2,000-mile common border includes state and local problem-solving mechanisms; transportation planning; and institutions to address resource, environment, and health issues. In 1993, the Border Liaison Mechanism (BLM) was established. Chaired by U.S. and Mexican consuls, the BLMs operate in "sister city" pairs and have proven to be effective means of dealing with a variety of local issues including border infrastructure, accidental violation of sovereignty by law enforcement officials, charges of mistreatment of foreign nationals, and cooperation in public health matters such as tuberculosis and H1N1 influenza. With nearly one million people and over one billion dollars worth of commerce crossing the U.S.-Mexico border each day, coordination of border crossing operations and development among federal, state, and local partners on both sides of the border is critical. Presidents Obama and Calderon created a high-level Executive Steering Committee for 21st Century Border Management in 2010 to spur further advancements in creating a modern, secure, and efficient border. In 2010, the U.S. and Mexico opened three new border crossings (McAllen TX — Reynosa, Tamaulipas; San Luis AZ — San Luis Rio Colorado, Sonora; and Donna TX — Reynosa, Tamaulipas). The multi-agency U.S.-Mexico Binational Group on Bridges and Border Crossings meets twice yearly to improve the efficiency of existing crossings and coordinate planning for new ones. The 10 U.S. and Mexican border states are active participants in these meetings. The United States and Mexico have a history of cooperation on environmental and natural resource issues, particularly in the border area, where there are serious environmental problems caused by rapid population growth, urbanization, and industrialization. 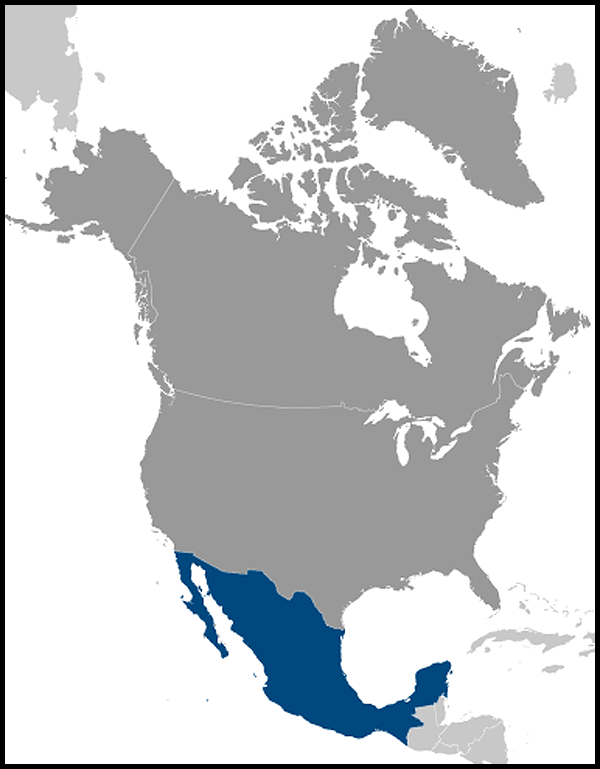 Cooperative activities between the U.S. and Mexico take place under a number of agreements such as:The International Boundary and Water Commission (IBWC) is an international organization with roots dating back to the late 19th century. The IBWC comprises independent U.S. and Mexican sections and has settled numerous difficult U.S.-Mexico boundary and water problems, including the regularization of the Rio Grande near El Paso through the 1967 Chamizal settlement. The IBWC determines and accounts for national ownership of international waters, builds and operates water conservation and flood control projects, and constructs and maintains boundary markers on the land boundary and on international bridges. In recent years, the IBWC has worked to resolve longstanding border sanitation problems, to monitor the quantity and quality of border waters, and to address water delivery and sedimentation problems of the Colorado River.The 1983 La Paz Agreement to protect and improve the border environment and Border 2012, a 10-year, binational, results-oriented environmental program for the U.S.-Mexico border region. The Border 2012 Program is the latest multi-year, binational planning effort to be implemented under the La Paz Agreement.A November 1993 agreement between the U.S. and Mexico, establishing the North American Development Bank (NADBank) and the Border Environment Cooperation Commission (BECC) under the auspices of NAFTA, in order to address border environmental problems. The NADBank uses capital and grant funds contributed by Mexico and the U.S. to help finance border environmental infrastructure projects certified by the BECC. The BECC works with local communities to develop and certify environmental infrastructure projects, such as wastewater treatment plants, drinking water systems, and solid waste disposal facilities. Prior to 2005, both institutions had separate Boards of Directors. In an effort to improve efficiency, the separate Boards were merged into a single entity.The 1993 North American Agreement on Environmental Cooperation (NAAEC), creating the North American Commission on Environmental Cooperation under NAFTA by the U.S., Mexico, and Canada, to improve enforcement of environmental laws and to address common environmental concerns.A series of agreements on border health (since 1942), wildlife and migratory birds (since 1936), national parks, forests, marine and atmospheric resources. In July 2000, the U.S. and Mexico signed an agreement to establish a binational Border Health Commission. The Border Health Commission meets annually and is made up of the federal secretaries of health, the 10 border states' chief health officers, and prominent community health professionals from both countries. A representative from the U.S. Department of Health and Human Services manages the U.S. Section in El Paso, Texas. The United States and Mexico have also cooperated on telecommunications services in the border area for more than 50 years. Currently, there are 39 bilateral agreements that govern shared use of the radio spectrum. When the United States completed the transition to digital television in 2009, a high percentage of Mexican border cities did the same well ahead of Mexico's deadline to complete the transition by 2021. Recent border agreements also cover mobile broadband services such as BlackBerrys, smartphones, and similar devices. The High Level Consultative Commission on Telecommunications continues to serve as the primary bilateral arena for both governments to promote growth in the sector and to ensure compatible services in the border area. Under this mechanism, the United States and Mexico signed an agreement to improve cross-border public security communications in the border area in 2009.